Although fruit smoothies can be very healthy, that isn’t always the case. Many cafe and restaurant smoothies are packed with high-fat and high-calorie ingredients such as ice cream, full-fat yogurt, fruit syrups and added sugar, which make the final products more like decadent desserts than nutritious snacks. To encourage weight loss, make your own smoothies and use them as balanced meal replacements. 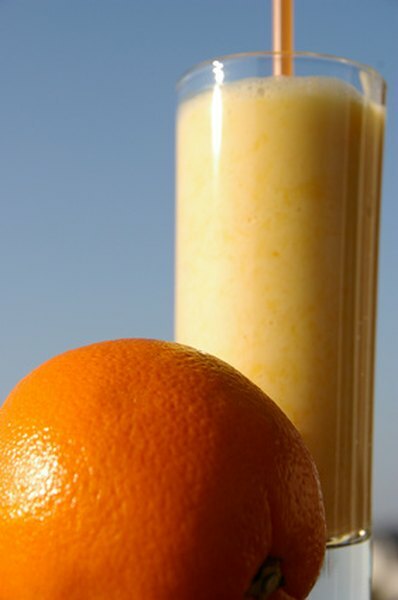 Be aware that commercially available smoothies are often too sweet and laden with calories to help you lose weight. A 24-ounce peach smoothie at a major juice chain, for instance, contains more than 450 calories, 100 grams of carbohydrates and 90 grams of sugar. To make your own healthier and lighter version, start with a base of 1 cup nonfat Greek yogurt, skim milk or soy milk. Add one piece of frozen or chilled fruit or 3/4 cup of sliced fruit. If you'd like, add a scoop of protein powder or wheat germ and blend the ingredients with crushed ice. You can safely use a daily smoothie as a meal replacement. According to a series of 2003 studies reported in "Nutrition Journal," overweight and obese participants who used meal replacements through a 40-week period lost more weight on average than participants who followed a more traditional low-calorie diet. Drink a healthy smoothie that has about 250 to 400 calories as a replacement for any main meal during the day. If you get hungry between meals, have a light snack. The amount of weight you can lose by using fruit smoothies as meal replacements depends upon the number of calories you conserve. Losing 1 pound requires burning or saving about 3,500 calories. If you normally eat about 700 calories at a meal and replace one meal per day with a 300-calorie smoothie, you could lose about 3/4 pound per week. The key to losing weight healthfully and keeping it off is following a balanced diet. If you have too many smoothies at the expense of other healthy food groups, you could suffer from nutrient deficiencies or other health problems, and you may even gain weight. Fruit is higher in calories and sugar than vegetables and some other natural foods, so physician Melina Jampolis of CNN.com recommends limiting your fruit servings to three per day if you’re trying to lose weight. Before you adopt smoothies as meal replacements or make any major changes to your diet, speak with your doctor.